A car buffer, when corded, is exactly the kind of tool that seems like a time-saver at the time of purchase. But give it a few months and the 'acquisition regret' and dust collect. Why? Well, because when it comes down to engaging in the task of polishing your vehicle, the untangling of that pesky extension lead in order to actually get going, seems too much of a chore. Ryobi have completely erased this issue with their cordless Ryobi 18V ONE+ Car Buffer (model no. R18B) - priced at £69.99 (tool only). So we polished our MINI Cooper, with little time to spare before the rain set in, just to see if it’s the tool all car proud people should own. 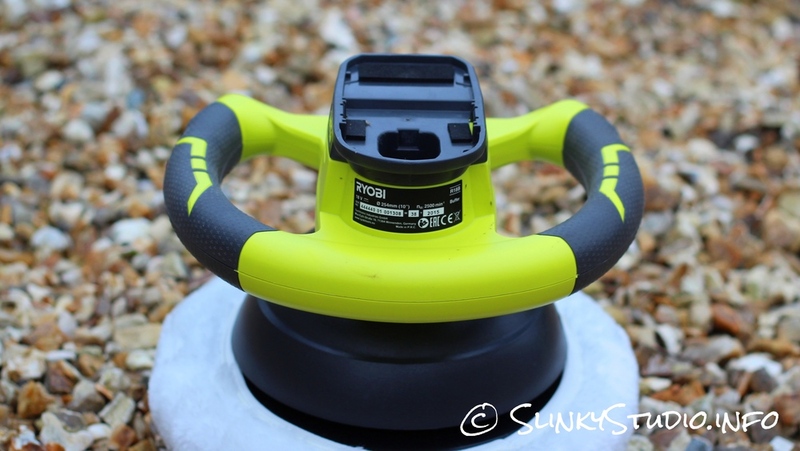 We appreciated the inspired design of the Ryobi ONE+ Car Buffer, mimicking a Formula 1 racing wheel and featuring two rubberised grip handles - it can be operated either way around too. There is only one functional control on the entire unit, that being a grey switch for on and off - brilliantly simple! As for durability, although we don’t drop many tools, we were unlucky enough to have the car buffer fall off a metre high wall onto a gravel surface. Despite some twigs that needed removing off the application bonnet, the body wasn't damaged at all. As ever this has the luminous Ryobi green body colouring, and is constructed from strong dense plastics. Supplied in the box are 2 bonnets - a polish application bonnet and a soft fleece-like buffing bonnet. It is a somewhat fiddly and strenuous task to stretch the bonnets over the dense polystyrene, although the severe tightness means that they don’t fall off or move around the 25cm circular buffer pad. Other than charging the battery and having polish, this is the only prep that is required. 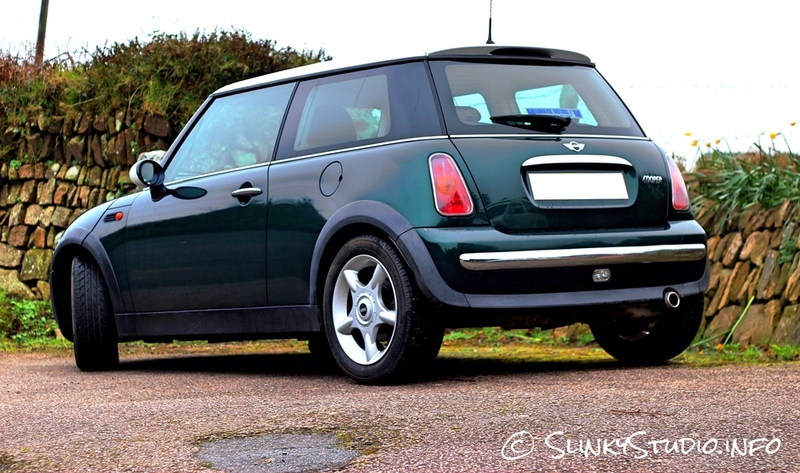 It goes without saying that we began the application process on a clean car - which in this case is a metallic British racing green MINI Cooper. Then we chose our polish - liquid and wax are both compatible with the supplied pads. We opted for liquid polish which we applied onto the buffer's bonnet and dabbed onto the dry body of the MINI to distribute before switching on. We self-discovered that if you apply too generous an amount of polish to the buffer's bonnet, you and the car windows get splattered in small modules of polish. The MINI Cooper is a particularly curvy car and wrapped in a great deal of chrome trimmings - we thought this could prove tricky in manoeuvring the buffer. However, that straight edge Ryobi has incorporated in their cordless car buffer design allows for very precise application. For example, we could comfortably sweep the ONE+ buffer around badges, wing mirrors and headlight chrome trims without getting polish on the glass. Additionally the dual handles and general balance make for comfortable vertical and horizontal usage. It’s definitely more flexible and therefore more appealing to operate than a chorded domestic car buffer, and considerably easier than utilising elbow grease. To apply on the entirety of the car took only 8 minutes and then we left to dry for 15 minutes. Once dry we interchanged to the soft fleece bonnet for buffering - a more strenuous activity showing us just how powerful this cordless car buffer is. Unquestionably the random orbiting head spinning at 2,500 RPM (reasonably quiet, we could still hear the birds singing) is very powerful indeed and scales away the dry polish on main body panels quickly, leaving no polishing swirls. On chrome the polish was noticeably quicker to buffer when compared to using elbow grease. Overall the Ryobi 18V ONE+ Car Buffer polished the entire vehicle very well, with a cloth only used to remove polish between door panel gaps. So we were very satisfied with the speed and performance Ryobi have given us without a chord. Most importantly, we all agreed that our MINI Cooper was shinier in comparison to manual cloth polishing. A subsequent shower after polishing displayed water droplets repelled off the body in a way we’ve never previously witnessed. We’re sporting the highest capacity battery for the Ryobi ONE+, being the new 5Ah Lithium+. This presented a battery issue, as we simply don’t have enough vehicles to drain it! From our 25-30 minutes of usage to polish one vehicle it used one bar of power. So subsequently we think, from studying the amount of minutes of runtime Ryobi claim from a lower capacity battery, that the 5Ah Lithium+ can squeeze out over 110 minutes of runtime. Get that shine in less time with the Ryobi 18V ONE+ Car Buffer. Quicker than the traditional cloth or wired counterpart, Ryobi once again prove that with their ONE+ ecosystem, going cordless doesn't mean a sacrifice in performance - with solid battery efficiency to boot!